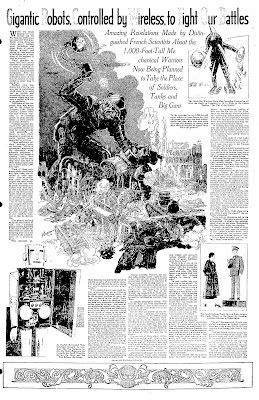 The article "Gigantic Robots, Controlled by Wireless, to Fight Our Battles," from the April 29, 1934 Fresno Bee (Fresno, California) was exceptionally sensationalistic. 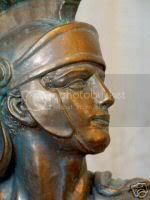 Professor [Felix Gaston] Gauthier disclosed in his address that two pacifistic-minded nations are today secretly (and supposedly unknown to each other) planning to construct gigantic fighting robots, controlled by wireless. 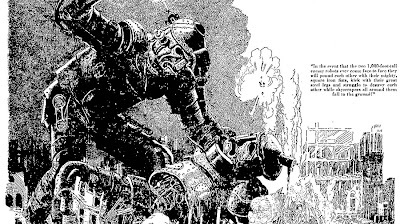 "These mechanical soldiers," declared Professor Gauthier, "will be of unexampled proportions. My informants, whose authentic statements I have never had reason to question before, have conveyed to me the startling news that each of these nations hopes some day to build robots 1,000 feet high!" They got the "fighting robot" part right, just got the scale wrong. And why is that bot beating up the Tin-man? I want that illustration on a poster. Did you say EVA? Cuz I heard sumone said EVA! Hahaha, very interestin this fakes in past. Friend, I've linked your interesting blog in mine one cos' i'll come back. Interesting that having built futuristic 1000ft high robots they are equipped to fight each other with ancient technology like the ball and chain. I really want a large print of this page. I'm going to be thinking about Black Sabbath's "Iron Man" all day now ... thanks a lot, PF.